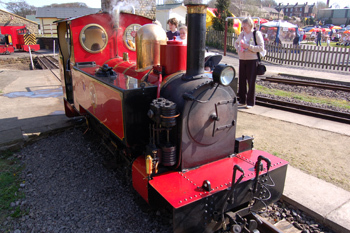 The Kirklees Light Railway is in the village of Clayton West, near Huddersfield in West Yorkshire. I lived in Clayton West for 17 years, and have many childhood memories about the old railway. I just about remember when the branch line was closed down in the 1980s. This is however the first time I’ve been to the light railway. Over the Easter weekend we took our daughter and three nephews on the train. Despite being a busy time for the railway we were able to get tickets for the next train 10 minutes after we arrived. The trains appeared to be running approximately every hour. There are different types of carriages: open carriages; closed carriages with windows and closed carriages without glass in the windows. It was a hot day and the open carriages were snapped up quickly, but there was spare space in the closed carriages. The outgoing train ride took about 30 minutes with views of trees, farm fields, a cutting, and a tunnel. Long enough to be worthwhile, but short enough that even our daughter managed to not get bored. The train stopped at Shelley where all the passengers got off. Facilities at that station were far more basic than at Clayton West. There was a Burger and Ice Cream van, and some temporary toilets. There is also a small children’s play area. As this was the Easter weekend they had an Easter Egg hunt and a Punch and Judy show. Each child earned themselves a Cadbury’s cream egg in the Easter egg hunt, with a few winning a small Easter egg instead. The tickets were £1 more over the Easter weekend, more than covering the cost of the eggs. We then took the train back to Clayton West. The facilities at Clayton West are very good. There is a baby changing in both the male and female toilets. There was quite a queue for the one in the ladies, but I was able to go straight to the one in the Gents. It was a bit basic, consisting of a table with a change mat on top, but was adequate. We ate in the restaurant, which had some children’s lunch boxes as well as doing simple hot and cold meals. The sandwiches (except for those in the lunch boxes) were freshly made and very nice. They were also selling Ice Creams which went down a treat considering it was a very hot day. There is also a shop (along with the ticket sales) selling a wide selection of Thomas the Tank Engine merchandise as well as some other railway related souvenirs. 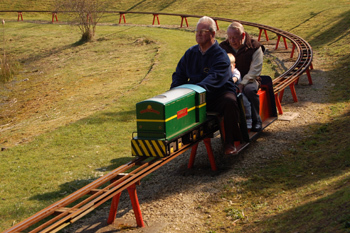 Other attractions include a miniature sit-on railway, a bouncy castle and footplate rides. The footplate rides were £1 per person. With a small child they can ride on an adults knee and the older children sit directly on the seat in the engine. The engine went up and down the siding twice, and the child (or me in the case of the smaller child), wound the handle to change between forward and reverse. The driver had control over the steam drive and the brake. The railway is run by volunteers who are very friendly and accommodating, particularly when I wanted to take photographs. I was allowed to get up close to the trains, and was allowed to go off the end of the platform to take photographs of the train leaving the station. They also run special Thomas the Tank Engine events, with a chance to meet Thomas, Percy, Mavis and Toby, and one of the Troublesome Trucks. 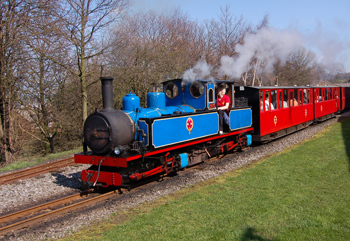 The Kirklees Light Railway is a good place to visit and is very popular with children. The Clayton West Station and free car park is located on Park Mill Way, in Clayton West. It’s off the Wakefield Road A636. This entry was posted on Saturday, May 5th, 2007 and is filed under Babies, Children, General, Photography. You can follow any responses to this entry through the RSS 2.0 feed. Both comments and pings are currently closed.